Useful knowledge prior to buying vinyl flooring. If you’re a smart vinyl shopper you’ve checked out the other sections on vinyl and may be getting close to buying this popular and versatile flooring. You’ve learned that the vinyl flooring of yesterday is long gone and newer, better performing vinyl flooring is underfoot today. In this section we’ll introduce you to product insights, performance considerations, construction points and installation tips about vinyl flooring you should be aware of before you buy. We’ll also provide a list of possible costs you should keep in mind; costs that go beyond the basic price per square foot. Today’s vinyl flooring offers wall-to-wall benefits. The vinyl offered today is quite different than the vinyl of yesterday. Advances in construction and aesthetics have produced fashionable products that are both durable and affordable. You should know that many of the popular patterns today are inspired by nature, including those that imitate the exquisite look of natural stone. With an abundance of patterns and new methods of texturing the surface, very realistic vinyl looks have been achieved. Vinyl flooring brings to mind the layer cake. Vinyl is constructed of several different layers: the wear layer, the printed or decorative layer, an inner core consisting of a foam and vinyl layer, and a backing. When selecting your vinyl flooring, thicker is not always better. It’s the density of the inner core that will help your floor resist rips, tears, gouges and indentations. Above all, concentrate on the top layer. Understand that the quality of the wearlayer, which is the actual surface layer of the floor, will determine how your floor will stand up to staining, scuffing and scratching. For example, a urethane wearlayer will help with stain resistance. We recommend you consult with us about the wearlayer that’s right for your home and lifestyle. Study and know local traffic patterns. When selecting the right vinyl for the rooms in your home, consider the room’s foot traffic and the types of activities that will take place. Ask us to review with you the manufacturer’s warranty and performance characteristics of the products that are available. Usually, extended warranties are available with upgraded products, giving you added confidence that your floor will stand up to your active household. Here’s the line on seams. Since vinyl comes in 6’ and 12’ widths, seaming may be necessary depending on the area to be covered. Certain patterns will hide seams better. For example, tile patterns with grout lines are better able to mask seams. Additionally, seam sealers may be visible in contrast with different vinyl textures and finishes. 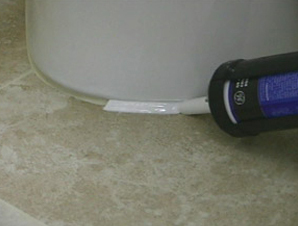 Be aware that it is your responsibility to maintain caulking in heavy water use areas. The “cost per square foot” of your vinyl floor is just one component of the entire project cost. To ensure there are no surprises, and the vinyl you select fits within your overall project budget, be sure to ask us to calculate the total cost of your floor covering project. Vinyl installation. Determine the cost per square foot to install it. Materials required to complete the installation. Your new vinyl floor may require additional materials to install it properly. Vinyl is one of America’s favorite floors, due to its unbeatable offering of design choices, durability and value. With the added knowledge from this section we hope we’ve made it a popular possibility for your home.